Produce professional quality drawings for a fraction of the cost of other CAD programs. CAD Pro is the most cost-effective CAD solution for Windows. CAD Pro will produce professional quality drawings and/or blueprints with easy to use “Smart Tools”. CAD Pro’s compact, straightforward toolbox design provides quick and easy access to all tools necessary to create and build any type of design. Quickly insert any type of drawing directly into Microsoft Word, PowerPoint, Publisher or Excel making your next presentation the best it can be. Powerful, fun and easy to use CAD Pro Platinum Series for Windows. The absolute best value in CAD software with over 2.5 million users world-wide! CAD Pro Extended Download Terms of Agreement: Save Time and Safeguard Your CAD Pro Software Purchase with EDS (Extended Download Service) Securely back up your CAD Pro software online for one (1) year. Now purchasing CAD Pro software online is more convenient than ever. Our Extended Download Service frees you from the time-consuming — but critical — chore of backing up your new CAD Pro software. Simply purchase EDS as part of your order. We’ll automatically store on our server a back-up copy of the CAD Pro software that you purchased and downloaded for one (1) year from the date of purchase. System crash? Hard disk error? No Worries! You can re-download your CAD Pro software anytime during your extended protection period. Your use of Extended Download Service is governed by the CAD Pro Terms and Conditions. CAD Pro Platinum Series has been selected to work with “Extreme Makeover Home Edition”, to help design the home and building projects that you see every week on the blockbuster ABC show. CAD Pro will be used in every episode of the 2006/2007 season. Association of Educational Publishers Distinguished Achievement Award goes to CAD Pro Home Remodel and Design software. This is probably the most FANTASTIC and VERSATILE easy-to-learn CAD program available today. With over 8,000 features, it leaves competitors in the dust for less than $70. You can design anything – buildings, mechanical parts, electronics, and much more using any home PC. 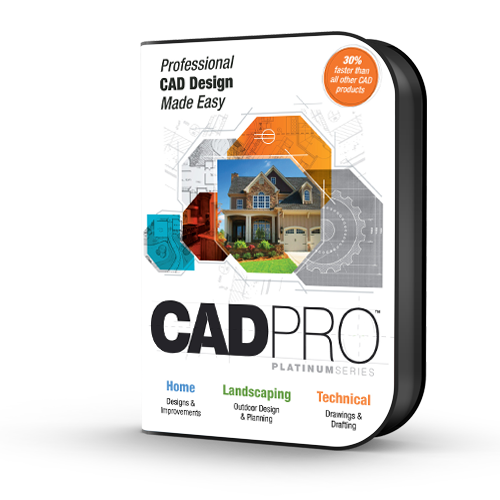 No compromises—the software performs as advertised… CADPro holds its own and remains a worthwhile choice for builders, interior and exterior designers and planners, renovation contractors, and serious hobbyists… The price is right. What more do you need?